Tenzin Palmo, who belongs to the Kagyu lineage, is one of the most dynamic forces in Tibetan Buddhism, and her life story is well worth reading. Born in Britain, Tenzin Palmo left for India when she was twenty and thereupon began a series of retreats and teachings that are rare for Westerners. She is an author, teacher and founder of the Dongyu Gatsal Ling Nunnery in Himachal Pradesh, India. She is best known for being one of the very few Western yoginis trained in the East, having spent twelve years living in a remote cave in the Himalayas, three of those years in strict meditation retreat. Lineage: 'Togdenma' (yogini) tradition of Drukpa Kagyu lineage. The Drukpa Kagyu lineage, which was founded in the twelfth century by the first Gyalwang Drukpa Tsangpa Gyare, was renowned for its highly accomplished yogis and yoginis. Out of compassion for the world, many practitioners adopted this austere path in order to accelerate the attainment of spiritual realization. 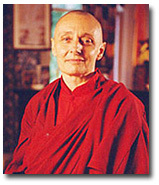 Biography: Jetsunma Tenzin Palmo was born Diane Perry in Woolmers Park, Hertfordshire, on June 30, 1943. Although spiritualist meetings were held in her childhood home, she realized at the age of 18 that she was a Buddhist when she read a library book on the subject. She moved to India at 20, where she taught English at the Young Lamas Home School for a few months before meeting her root lama, the 8th Khamtrul Rinpoche. In 1964 she became only the second Western woman to be ordained in the Tibetan Buddhist tradition, receiving the name Drubgyu Tenzin Palmo, or 'Glorious Lady who Upholds the Doctrine of the Practice Succession'. The ordination was as a shramanerika, or novice nun, the highest level of ordination currently available for women in the Tibetan tradition where the bhikshuni sangha has died out. However, with the support of her teacher, in 1973 Tenzin Palmo received the full bhikshuni ordination in Hong Kong, one of the first Western women to do so. Living at Khamtrul Rinpoche's monastery as the sole nun among 100 monks provided Tenzin Palmo with first-hand experience of the discrimination that restricted women’s access to information that was imparted freely to men. Eager for instruction, she felt frustrated by the fact that she was kept out of most monastic activities because of misogynistic prejudices.This phase lasted for six years. Then Tenzin Palmo left the monastery at her teacher’s suggestion to go to Lahul in the higher reaches of the Indian Himalayas, where she would eventually enter the cave and launch herself into uninterrupted, intense spiritual practice. In 1976 Tenzin Palmo commenced living in a cave in the Himalayas measuring 10 feet wide and six feet deep and remained there for 12 years, for three of which she was in full retreat. The cave was high in the remote Lahul area of the Indian Himalayas, on the border of Himachal Pradesh and Tibet. In the course of the retreat she grew her own food and practiced deep meditation based on ancient Buddhist beliefs. In accordance with protocol, she never lay down, sleeping in a traditional wooden meditation box in a meditative posture for just three hours a night. The last three years were spent in complete isolation. She survived temperatures of below −30° Fahrenheit (−35°C) and snow for six to eight months of the year. Tenzin Palmo emerged from the cave in 1988 and travelled to Italy as visa problems meant she needed to leave India. Since her retreat Tenzin Palmo has taken on the cause of equal rights and opportunities for Buddhist nuns. In support of this, she spent several years travelling the world fund raising for a new Buddhist nunnery, as her root lama had asked her to do. In 2000, the Dongyu Gatsal Ling Nunnery was opened with the purpose of giving education and training to women from Tibet and the Himalayan border regions. At this nunnery, Tenzin Palmo also plans to re-establish the extinct lineage of togdenmas, a Drukpa Kagyu yogini order. within the Drukpa Kagyu tradition. Tenzin Palmo is a member of the six member 'Committee of Western Bhikshunis', an organisation of senior Western nuns supported by two Advisors from Taiwan (Ven. Bhiksuni Heng-ching Shih, Professor of Philosophy at Taiwan National University [Gelongma ordination 1975 in San Francisco] and Ven. Bhikshuni Wu-yin, Vinaya Master). It was formed in the autumn of 2005, after the Dalai Lama told Bhikshuni Jampa Tsedroen that the Western bhikshunis should be more involved in helping to establish the bhikshuni ordination in the Tibetan tradition. On 16 February 2008, Tenzin Palmo was conferred as Jetsunma (reverend lady) in recognition of her spiritual achievements as a nun and her efforts in promoting the status of female practitioners in Tibetan Buddhism by the head of the Drukpa Lineage, the Twelfth Gyalwang Drukpa /Gyalwang Drukpa the XIIth - Gyalwang Drukpa. Cave in the Snow- by Vicki Mackenzie (ISBN 1-58234-045-5). Reflections On A Mountain Lake- Teachings on Practical Buddhism (ISBN 1-55939-175-8).